Facts about Helvola water lily plant. Nymphaea helvola is a species of water lilies. The species is also called Pygmaea Helvola. It is part of the Nymphaeaceae family. They grow in USDA hardiness zones 4A through zone 11. The Helvola water lily species blooms in mid-summer through early fall. Helvola water lily comes in several colors. It is primarily a gold or yellow-orange water lily, though there are red and pink varieties. The flowers are cup or bowl shaped, with pale yellow laves and a dark yellow center. The Helvola water lily have shiny, glossy, mottled foliage. The leaves are rounded and up to six inches (15.2 cm) in length. The Helvola water lily spread is up to eighteen inches (45.7 cm). The blooms are at water level or just above it. They may reach a height of five inches above the water. Flowers close each evening for the night. Helvola lives in bogs and water gardens. It can tolerate soil pH ranges from 6.1 to 7.5. You can propagate by dividing the tubers and bulbs or by dividing the rhizomes. 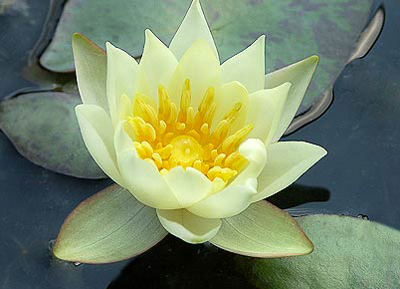 The Helvola water lily plant can grow new lilies from the rhizomes. The roots need to be fully submerged. You can propagate the lily by taking offsets in the summer and placing them in pots of shallow water until they are established. The Helvola water lily grows in clay and loam soils in ponds and bogs. It won’t grow in ditches or fast, flowing streams. The Helvola water lily can grow in small water gardens and pots, needing only around three square feet (.91 square meters) of water surface to spread. Helvola water lily can grow for several years if they are not killed by frost. They can grow in full sun or partial shade. The Helvola water lily leaves turn yellow about after about six weeks. Helvola water lily need to have the yellow leaves removed regularly. Each flower lasts a few days. You need to perform deadhead pruning with this species. The Helvola water lily is susceptible to a number of pests such as the water lily aphid, the china mark moth and leaf-mining midges.